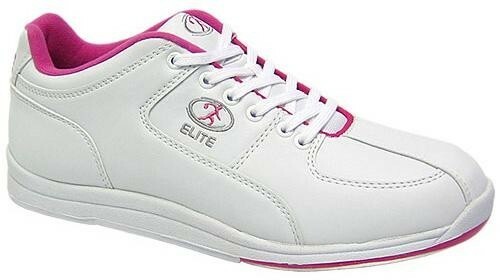 These Elite Women's Ariel White/Pink bowling shoes are designed for utmost comfort and performance. Both left and right-handed bowlers can wear these shoes as they have universal soles on both feet. Don't miss out on these shoes today! Elite also offers an outstanding,free two-year warranty on these shes. Wow! By Sheri from Daly City, Ca. So comfortable and good looking too. THis is the first shoe and first time to play bowling. Despite all the positive comments, we found that material on the bottom of the shoes to be very very slippery. My wife has a very unorthodox delivery as she slid to the approach her left foot would always slide out from under her. She attempted to wear them around the house to scuff up the soles and on our wooded floors the shoes were equally slippery. The shoes themselves are very comfortable and stylish. I would not recommend these shoes to my family and friends. Bowling shoes are great. Love buying from this company. Great Shoes, Cute and Comfy! a very bulky heavy shoe and not as described. Also very slippery. Hello Alice! Unfortunately this shoe does not come in a wide width. Yes Boots, all shoes (except closeouts) are returnable as long as they are in perfect, unused condition. Hi Cowboy peg! These shoes come in a standard B width. can I return them if does not fit well? Do these shoes run small? We have not hand any feedback indicating they run small. Should run true to size. Due to the time it takes to produce the Elite Womens Ariel White/Pink ball it will ship in immediately. We cannot ship this ball outside the United States.